Carbon Air Filter deodorizes and absorbs odor and household smells! MERV 11 Plus Carbon Air Filter- Dual Media in one convenient air filter! Free Shipping in the Continential USA! 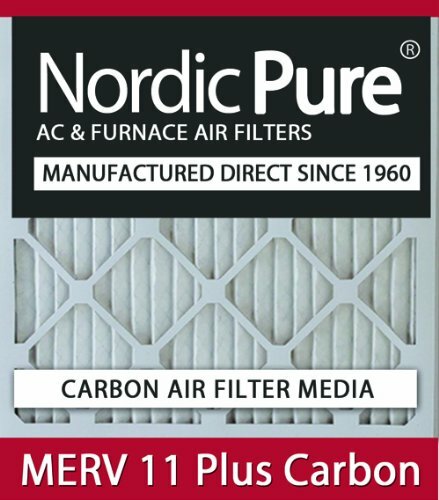 Nordic Pure is now offering MERV Plus Carbon air filters. The electrostatic MERV Plus Carbon air conditioning filter has a MERV media plus an added layer of polyester based media impregnated with activated carbon. The dual combination results in two different medias combined into one convenient furnace - air conditioning filter. The MERV pleated media captures microscopic airborne dust, pollen, allergens, mold spores, pet dander, bacteria and particulates carrying bacteria and viruses in the air for better indoor air quality. The high quality activated carbon air filter polyester media naturally deodorizes the air by absorbing and eliminating household odors that may come from pets, garbage, bathrooms, smoke, litter boxes or cooking. It also removes levels of concentration of gases (VOC's) as well as particulates in the air while maintaining excellent air flow properties. Nordic Pure filters use permanently charged electrostatic media that helps dust cling to the filter. This helps protect your family from allergy causing pollen, fine dust, tobacco and cooking smoke, and other airborne particles. The non-woven synthetic filter media will not support the growth of mold or bacteria, keeping your home healthier. Nordic Pure has been manufacturing high efficiency pleated furnace filters, carbon filters and ring panel filters for your furnace and air conditioning systems since 1960. Nordic Pure can make most odd sized custom HVAC filters for a low price with fast free delivery. Changing your air filter is the first step in insuring your HVAC system runs at its optimal level this season. Generally, you should change your 1 inch and 2 inch air filters every 30, 60, or 90 days. The 4 and 5 inch filters should be changed every 3 to 6 months. Standard filters generally ship within 2-10 business days. Actual shipping time will depend on delivery address. Try them, and we are certain you will be pleased with our Nordic Pure MERV Plus Carbon air filters.